This article is false and inaccurate. Glenn Beck never depicted Mayor Michael Bloomberg as a Nazi. The picture in question was based on a Soviet propaganda poster. See: http://www.sovietposters.com/p… It had nothing to do with Nazi imagery of any kind. Not only do you owe Mr. Beck and apology, you also owe one to your readers. Instead of spreading ABC’s false report, the Philadelphia Jewish Voice should be spreading the truth. Nope. Look at the two pictures. It’s quite obvious what Mr. Beck was parodying. When people criticize Jews as being leftist sock puppets, I always rebut them. Obama’s patron George Soros was born a Jew. His parents gave him to a non-Jew to protect him from the Holocaust, just before they were hauled off to the camps. George was about 12 at the time, as I recall. George willingly went around showing the Nazis where the Jews lived so their property could be stolen and they could be shipped off to the camps. There are evil people, and people of weak character and little courage, in all heritages, ethnicities, and religions. For example, Feinstein, Schumer, Bloomberg, and the others are evil, not because of their names or because they pretend to be a Jews, but because of their behavior, and there are are plenty of Jews who have no use for such Judenraten JINOS and their colleagues in crime. 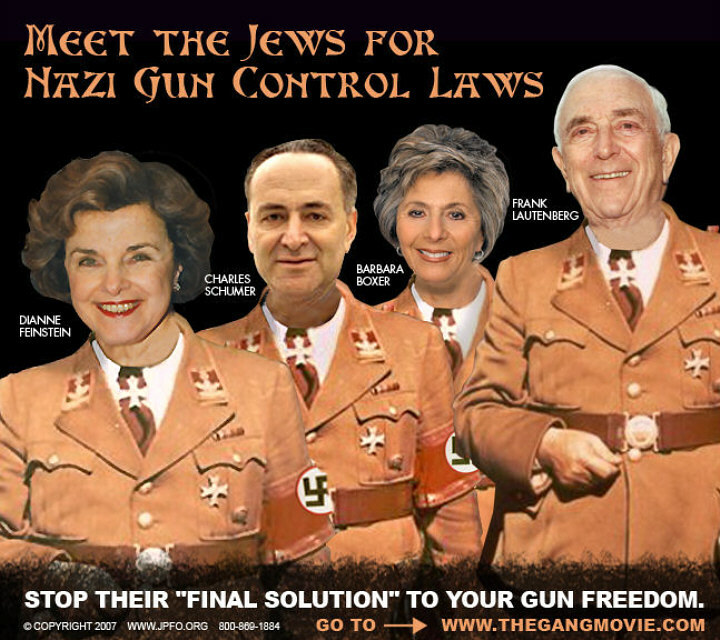 (And have the courage and integrity to call them what they are … see jpfo.org and, specifically http://jpfo.org/images02/handb… to see for yourself how many Jews feel about Feinstein and the others who seek to disarm us so they can control us. While I believe that the image more closely symbolizes Russian communist imagery than Nazi imagery, I am NOT offended when someone who acts like a Nazi tyrant is depicted as or compared to one. If you don’t know and acknowledge your enemy, you will always lose (be a victim). I am greatly saddened by how many in the Jewish community have forgotten the true meaning of the pledge “Never again!”; support leftist causes that are creating the same sort of conditions that allowed Hitler, Stalin, and other butchers to come to power; and have have been hoodwinked and brainwashed through “public education” and a compliant, leftist media to see the leviathan of government as their protector and provider, rather than the oppressor it has become. I am sickened by Jews who support a regime that has, and continues to, throw Israel under the bus in support of its Muslim Brotherhood allies. I would submit that we are at a worse place than Germany was just before Hitler’s total takeover and that Obama is capable of even greater evil than Hitler and Stalin combined. Just think, Obama admires Mao … He has Mao ornaments on the WH Christmas tree. Wake up and smell the tyranny! Reader “leo_keil” defends Glenn Beck by claiming that his caricature of Mayor Michael Bloomberg is more a reference to Stalin than a reference to Hitler (as if either comparison was really apropos of mere gun show background checks). I wonder whether he will make a similar defense of fellow right-wing reader “carlwk3c” who posts a link (http://jpfo.org/images02/handbillpoliticians-large.jpg) to an image with the heads of Jewish Democratic Senators Dianne Feinstein, Charles Schumer, Barbara Boxer and Frank Lautenberg superimposed on the bodies of Nazi officers featuring the caption “Stop their ‘final solution’ to your gun freedom”. Not only are these readers overreacting to an attempt to keep weapons out of the hands of felons and people with psychological problems, but by introducing the notion of the Holocaust into a political discussion, you cheapen the memory of those who perished. If you call everything a Holocaust, then the Holocaust means nothing. A reading of my post will show that I was not defending Glenn Beck or anyone else. I was condemning the inaccuracy of the ABC News report and The Philadelphia Jewish Voice’s repeating that false report. Whether a reference to the Soviets is better or worse than a reference to the Nazi’s is not a call I have any interest in making. For sure, I find the picture of Dianne Feinstein, Charles Schumer, Barbara Boxer and Frank Lautenberg highly inappropriate. The question was never whether pictures of this type are appropriate. The question was whether the picture from Glenn Beck’s speech was a reference to the Nazis. The fact is that it wasn’t. Had ABC and The Philadelphia Jewish Voice condemned that picture as a Soviet reference, I would have had no problem. What matters here is accuracy.